Who would've imagined that the folks behind the BBC's Sherlock would be upset about CBS's new series about a modern day Sherlock Holmes? CBS's decision to order a pilot for Elementary - a new TV show with a modern day take on Sir Arthur Conan Doyle's Sherlock Holmes stories - was met with a lot of wry head-shaking across the Web last week. 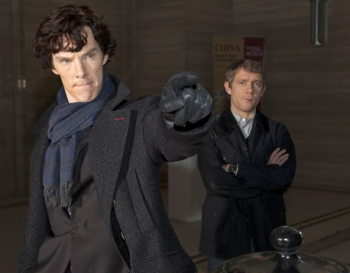 This was because the show's premise bears an uncanny resemblance to the BBC's own (excellent) show, Sherlock. It turns out that Sherlock's creators noticed the similarities, too, and are warning CBS that it could face a nasty legal battle over the new show. On one hand, the concept of an updated Sherlock Holmes can't really be copyrighted, but Vertrue and her co-producers do have a substantial leg to stand on when it comes to things like the settings, costumes, characters, narrative/visual style, and plotlines featured in Sherlock. That could cause a lot of legal headaches, considering how much background checking will (potentially) need to be done with each episode; if things become too much of a hassle, CBS may just abandon the project.